Your browser seems to be Internet Explorer. Please use Firefox, Opera or Safari to see all CountDownr features. or run them on the Widgetop Web Desktop. Add your own countdown counter to your web site or create a link to CountDownr with your favourite event. Counters for a specific date and time. These counters can be repeated daily, weekly, monthly or yearly which advance automatically when the alert goes off. They are perfect for reminders on single events, lunchbreaks, weekends, paying your monthly bills or birthdays and holidays. Counters which read the upcoming events from public Google Calendars. Any public calendar can be the source for a counter. It advances automatically to the next event after each alert. Where is the state stored? CountDownr stores the state completely in a local cookie. There is no personal data stored on our servers. This way the set of clocks is individual for each computer. What about my private calendars? Unfortunately Google doesn't support the access to your private calendars the same way as for public calendars at the moment. 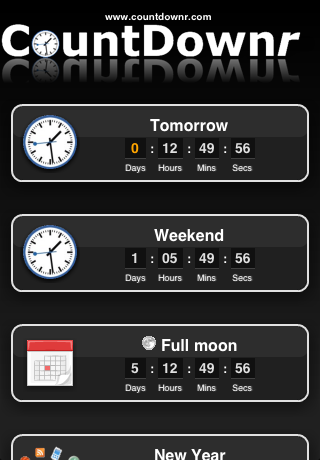 If you want to get a counter for your private calendars please try the Calendar Counter on Widgetop. I like the counters, can I have one on my homepage? Sure. Go to our Syndication page and create the code for your counter. Copy that code snippet to your homepage and it should work. I would be pleased to hear about it. Can we promote our events on your site? CountDownr is a great place to advertise your events and event calendars. Please see our advertising page for the details. Yes, actually this project started as a little Dashboard widget. You can download it from here. If you want to see it running you can test on the Widgetop web desktop. Countdownr runs on IE but there are limitations because even IE7 still doesn't support the CSS opacity property. With IE6 you won't have any fun because it misses support for transparent PNGs. If you want to have see the counters perfectly please use a modern browser like Firefox, Safari or Opera.